The Post Removal System (PRS) kit is a device intended to be used when the removal of posts with ultrasonics is unsuccessful. The PRS kit can mechanically engage any obstruction whose cross-sectional diameter is 0.60 mm or greater. The kit affords simplicity in use and provides extraordinary opportunity in predictably removing different kinds of post systems and other intracanal obstructions. 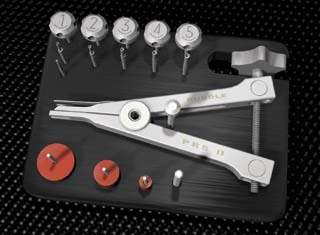 The PRS kit contains an extracting plier, a transmetal bur, five trephines of varying internal diameters, five corresponding tubular taps whose internal diameters range from 0.60-1.60 mm, a torque bar, tube spacers, and a selection of rubber bumpers of varying diameters to properly cushion and protect the tooth during the loads generated by extracting forces. The largest trephine that will not go over the head of the exposed post is selected. The PRS’s latch-type trephines should rotate at approximately 15,000 RPM in a clockwise (CW) direction in a slowspeed, high torque handpiece and, with lubricants, are utilized to machine down a 2-3 mm length of the most coronal aspect of the post. An appropriately sized rubber bumper(s) is inserted onto the selected tubular tap. The tap is manually turned counter-clockwise (CCW) to form threads and actively engage the post. The post removal extracting plier is then mounted onto the tubular tap and the jaws of the plier opened by turning the screw knob clockwise (CW). As the jaws open, the tooth is visually inspected to assure it is cushioned and protected. Increasing pressure will be noted when turning the screw knob, and ultimately this action will serve to remove virtually any post.